Painter, part of a family of artists and architects of German origin, active in Italy. (In Italy he is known as Ignazio Stella.) He trained under Carlo Cignani in Forl before settling in Rome in 1701. He returned c. 1713 to Forl, where he produced many altar and easel paintings for private and monastic patrons in the Emilia-Romagna region. 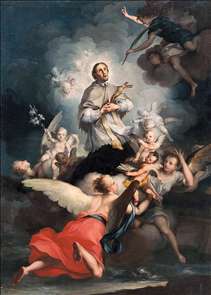 His earliest known work (1718-19) is the cycle of altar paintings in the church of S Onofrio in Lugo, near Ravenna. The paintings, depicting scenes from the life of the saint, are partly based on Cignani s frescoes (1665) in S Michele in Bosco, Bologna. In 1720 the church of the Suffraggio in Lugo commissioned further panels and fresco. In Forl Stern painted a Virgin with Child and Saints (now in the cathedral) for the Dominicans. The panel draws on Guido Reni s Madonna with Cherubs in Glory (1631-2; Bologna, Pinacoteca Nazionale). The major work of the Forl period is the cycle of Four Seasons for the Palazzo Arisi, Piacenza (Kassel, Schloss Wilhelmshhe). Having painted an Annunciation for SS Annunziata, Piacenza (now in Piacenza, Madonna di Campagna) in 1724, Stern returned to Rome. Apart from some minor frescoes, such as those at S Paolo alla Regola, and altarpieces such as St John Nepomuk (for Camposanto Teutonico, now Rome, Palazzo Barberini) few of his Roman works remain in situ. Ignaz s son Ludovico Stern was a prolific portrait and history painter in the circle of Anton Raphael Mengs, and his daughter Veronica Stern (1717-1807) was a miniature painter. Ludovico s son Giovanni Stern (c. 1734-after 1794) was an architect, as were Giovanni s own sons, Raffaele Stern and Ludovico Stern (1780-1861). See more details about "St John of Nepomuk"